These bears are found living in forests and caves. Their diet consists of fish, fruit, and the meat of smaller animals. Black and brown can be nearly the height of a man and are incredibly strong. They can be extremely territorial especially if they feel their cub or food supply might be threatened. Their thick hide provides a degree of natural armor and combined with their sharp claws they can be a very intimidating adversary. Bears should be avoided by unskilled or novice fighters. When bears are hunted it is largely done so in order to gather their hides for use in leather working. Being as large as they are, bears also provide a great deal of meat. 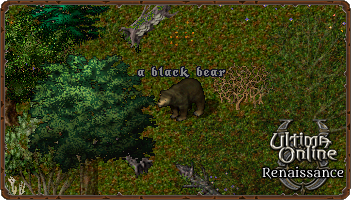 Skilled animal tamers have been able to take bears as pets and companions on their journeys.